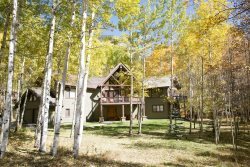 Find your perfect Crested Butte rental property with our Crested Butte South cabins. Choose from the larger, 10 guest Eagle View rental that is perfect for a large reunion or family vacation or the Shavano Cabin that can accommodate six guests. Both of our Crested Butte cabins come complete with amenities including cozy fireplaces, mountain views, and more! Choose the best Crested Butte cabin for your vacation needs and we guarantee endless fun and relaxation!